Filtre UV Hoya de 58 mm. Occasion en état quasi-neuf. Condition: Used, but very good. May show light cleaning marks at edges if examined closely under light. This does not impact on image quality whatsoever. Filtre polarisant Hoya HD CIR-PL 58 mm. Occasion, très bon état. Je vends ce filtrepolarisant circulaire Hoya HD CIR-PL de 58 mm de diamètre. Il a étépeu utilisé et est en excellent état (aucune rayure). Filtre Hoya 82A de 58 mm. FILTRE HOYA. Made in Japan. Idéal pour le noir & blanc. Les accessoires d'occasion ne sont ni repris ni échangé. In ottimo condizione. En parfait état/in perfect condition. Hoya 58mm Polarising filter - 58mm Skylight1B and 52mm to 58mm step up ring. Cased and boxed as per photos. HOYA (HIGH QUALITY). FILTRE 58 MM. FACTURE A VOTRE NOM. HOYA PROND 100000 est un filtre haute concentration de 100000 fois le facteur de filtre. Hoya 58mm Pro ND200 Filter. Professional quality ND500 filter from market leader Hoya. Multi-coated glass. This will enable you to use a much wider aperture or a slower shutter speed then normal. Why buy from us?. Pour reflex bridge compact Ninon canon ou autre diamètre 58 mm. Filtre Hoya FL-W de 58 mm. La série Hoya ProND est idéale pour les applications vidéo et photographie. Hoya ND Gris neutre. Ainsi, il vous suffit de régler la WB une seule fois quelque soit le filtre utilisé. • verre optique de qualité professionnelle de Hoya. Les filtres propose unemonture fine en aluminium léger. Hard Coated HMC Multicoating process suppresses ghosting, flare and reflections, and increases light transmission. Clouds are dramatically improved almost to the mood of a thunderstorm. It is more effective in cutting through haze, and moonlight effects are easily accomplished. Absorbs the ultraviolet rays which often makes outdoor photographs hazy and indistinct. This multi-purpose, all-around filter can serves as a permanent lens protector. Digital multi-coated filters greatly reduce the appearance of lens flare and ghosting. 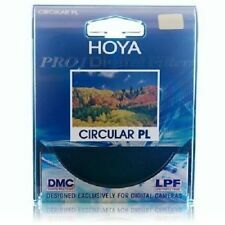 NEW Genuine HOYA NEW Genuine HOYA 58mm HD UV MULTI-COATED HIGH DEFINITION GLASS FILTER. The Hoya UV filter absorbs the ultraviolet rays which often makes outdoor photographs hazy and indistinct. A muliti-purpose fine-weather filter for color as well as black and white films. Professionnel filtre de protection de la qualité de leader du marché Hoya. Verre multi-couches. Véritable Hoya 58mm HD Protectrice Filtre. Qualité Professionnelle Multi-Couches. 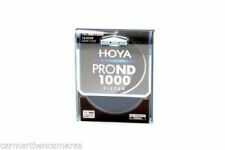 Hoya 58mm HD Objectif Filtre Protecteur. Hoya 58 mm Close Up +4 Objectif Macro Filtre-Nouveau UK STOCK. The Hoya Close Up are designed to allow you to extend your lens' close focus distance. These filters are perfect for anyone wanting to try out macro photography with their existing lenses or get closer than their macro lens can currently get. 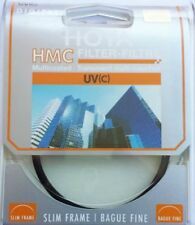 The Hoya HMC UV Filter is a multi-purpose, fine-weather filter that is designed to optimise the photography experience of digital SLR users. UV filters absorb ultraviolet rays that often make outdoor photographs hazy and indistinct, and can be constantly fitted to a lens to provide improved clarity and colour balance, as well as to provide protection to your lens. HOYA - Y5UXUVC058. - Toutes nos expéditions sont suivies (Lettre suivi, colissimo suivi ou transporteur) et bien protégées. This is a brilliant high quality filter kit which includes one Kenko 58mm UV Smart Multi-Coated and one Kenko Circular Polarising. FUNCTIONS OF THIS KENKO CIRCULAR POLARISING (CIR PL) FILTER. 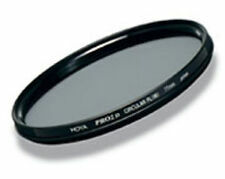 FUNCTIONS OF THIS KENKO UV MC FILTER. Nice Condition with Hoya Filter Keeper, and Box ( Box bit untidy & lid does not close, opened at end ). 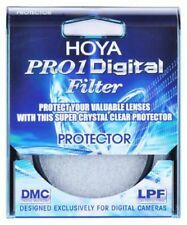 The Hoya HMC Digital UV(C) Filter is a multi-purpose fine-weather filter that absorbs the ultraviolet rays which often makes outdoor photographs hazy and indistinct. A multi-purpose filter for colour as well as black and white film and digital photography, the clear UV filter can also be left on the lens to serve as a permanent lens protector. Absorbs the ultraviolet rays which often makes outdoor photographs hazy and indistinct. This multi-purpose, all-around filter can serves as a permanent lens protector. Digital multi-coated filters greatly reduce the appearance of lens flare and ghosting caused by reflections. HOYA 58 mm Close Up II +3 HMC Macro Filtre-Neuf, UK stock. 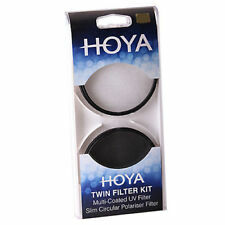 The Hoya Close Up II filters range from 1 to 4, are design to allow you to extend your lens' close focus distance. These filters are perfect for anyone wanting to try out macro photography with their existing lenses or get closer than their macro lens can currently get. This effect is often used to increase the contrast and saturation in blue skies and white clouds. HOYA's polarising filters do not affect the overall color balance of a shot. HD POLARIZING FILM. 25% Greater Light Transmission than Standard Polarizing Film. Absorbs the ultraviolet rays which often makes outdoor photographs hazy and indistinct. A multi-purpose fine-weather filter for color as well as black and white films.